Chicago. It was my first. The crowds are tremendous and it's an easy, flat course. The stream of thoughts running through my head. Running, swimming, biking, basketball, watching football, the bleachers of Wrigley Field. Just myself and the road. "We don't stop running because we get old. We get old because we stop running." Complete 100 marathons, run a marathon in all 50 states, finish an ironman tri(did this one already). I am completely addicted. I love the solitude and the endorphin high. Finishing Chicago for my first marathon in 2002 was both amazing and addicting. I had so much fun and the sense of accomplishment at the end was incredibly gratifying. Pacing is two-fold for me. First and foremost it provides the wonderful opportunity to meet new runners and help them reach their marathon goals. Secondly, I am very competitive by nature and have difficulty running a race for pleasure only. I always end up pushing myself to run the fastest time possible. Pacing forces me to run the marathon at a comfortable pace, and consequently allows me to run many more marathons throught the course of a year. Madison 2009. I actually had 5 runners stay with me start to finish. A couple finished their first marathons and 1 qualified for Boston. Often times you lose runners the majority of runners around mile 20. Some feel good and push ahead. Others have to drop back. 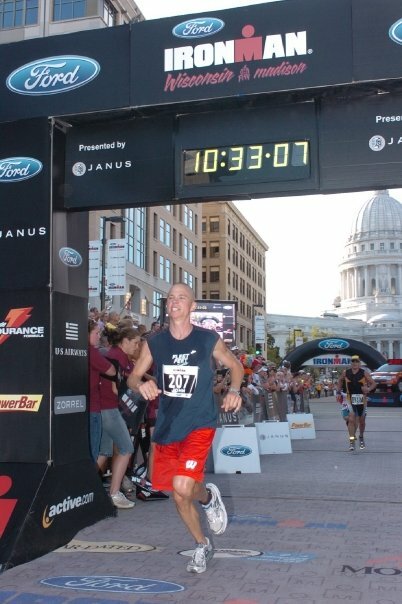 But at Madison 2009, a handful of runners picked the perfect time for themselves and it was a pleasure to take them all the way from start to finish. The most common mistake runners make is starting too fast. 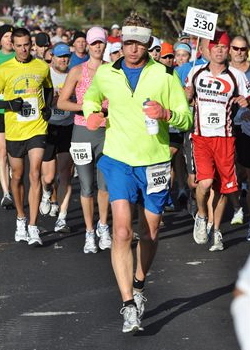 Running with a pacer forces you to keep a steady pace early in the race. I would advise any first time marathoner to run with a pace group for atleast the first 15 miles. I haveno superhuman qualities. I love to run but also enjoy swimming and biking. I have great cardiopulmonary reserve simply because I spend so much time doing aerobic exercise. I don't consider myself a great pacer. I just run a comfortable marathon at close to even splits and enjoy the ride. Any running tips for runners about to join your group? I'm not the most extroverted pacer, but I'm happy to talk with anyone who has questions or just wants to chat. Feel free to gab me up as we go. I'll run roughly even splits every mile. I will not run uphill miles slower or downhills faster. Keep that in mind if you want to fall back on an uphill and catch up on a downhill. I will slow down at the water stops so everyone can pick up fluids without having to worry about losing the pace group. Have a great run and enjoy it! !